Something I’ve noticed in my work as a leadership coach is people’s surprise that even the top leaders in their field can be troubled by fears. People think once you make it to a certain level you have it all under control. But running a business and leading people are difficult, complex jobs, and leaders—like the rest of us—have their share of fears. It’s not having fears that’s important—we all do, at least once in a while. It’s what you do with your biggest fears that makes a difference in your future. Here are some of the top fears I coach top leaders through. Do any of them sound familiar? Not being smart enough. Many leaders are afraid of not being smart enough, knowledgeable enough, and competent enough. It’s a fear so common it has a name—imposter syndrome, the feeling that you’re not at all qualified to be doing what you’re doing and that you landed where you are through some oversight or mistake of the universe. Left unchecked, this is one of the most destructive fears to leadership. Learn to leverage your fear by tapping into your competences and capabilities so you can build the confidence you need to banish imposter syndrome. Making a bad decision. Making decisions is a big part of leading, and it’s something you likely do daily if not hourly. It’s easy to lock up out of fear that you’re going to make a wrong choice and disaster will follow. But here’s the thing: you will make a wrong decision at some point. Every leader does. And the best way to overcome the fear is to remember that fact. Taking risks. Every leadership role demands a significant amount of risk taking, which leads naturally enough to fear of failure. But a certain amount of risk is necessary for successful leadership—so allow yourself to feel the fear, then do it anyway. Being ineffective. Every leader wants to be effective, and fear often takes the shape of concern that you’re not being as impactful or credible as you could be. The only way to overcome the fear of ineffectiveness is to make sure your character and values always lead the way. You can never go wrong when you lead from within. Failing badly. The fear of failure is possibly the most pervasive among leaders. That’s why it’s important to remember, is that failure not fatal. Often failure is the thing that causes you to look at things differently and improves your odds of success the second time around. Virtually every success includes some degree of failure. Fears will always influence us and cause a certain amount of inner turmoil. It’s what we do with these fears that will make the difference. Lead from within: As a leader, you gain strength, courage and confidence through every experience in which you really stop to look fear in the face and work through it with dignity. 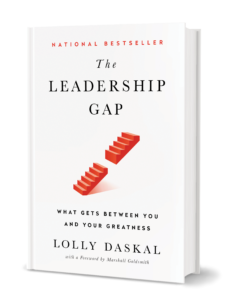 The post How to Overcome Your Biggest Leadership Fears appeared first on Lolly Daskal. In business, today we seem to focus more on the exciting parts of our work—innovation and creativity—and less on the day-to-day requirements of leadership. It’s great when you have an organization that’s all about speed, agility, innovation, and creative thought, but it’s your job as the leader to make sure that people understand the vision, that the work’s getting done, that the necessary results are being achieved. Without leadership, you won’t have coherence or consistency—or success. A great leader needs an extensive set of skills, from planning and delegation to communication and motivation. It’s tempting to focus your growth and development on the areas where you’re already comfortable or those that offer the most excitement. But for long-term success, it’s wise to analyze your skills across the board and challenge yourself to improve in every area. Maintain good communication. As a leader, you have to keep everyone informed about projects, goals, and deadlines, so it’s essential that you communicate well. When you are open with your team they’ll be open with you, creating opportunity for dialogues, feedback, and any questions or issues they want to address (and shutting down gossip and rumor mills in the process). Build meaningful relationships. Get to know members of your team individually—personally as well as professionally. When you put the effort in to get to know a bit more about the people you work with, and you better understand who they are and what they do, everyone works more productively and effectively. Delegate effectively. Delegation is key to great leadership. People perform better and are more engaged in their roles and responsibilities when they feel their skills and talents are recognized and put to use, and when you know the strengths and goals of each person it becomes easier to delegate strategically. The benefits are twofold: Your team members grow and learn under your supervision, and you can achieve much more. Manage conflict. When there is conflict—and there is always conflict—make sure not to ignore it but to address it and manage it. Turning a blind eye or hoping it goes away on its own can lead to a negative atmosphere, which in turn can affect the whole team and ripple out into the organization. It is crucial to address and manage conflicts in way that people feel understood and know that a solution can be reached. Be decisive. To lead a team well you have to be decisive, willing to hold strong opinions along with an open mind. Decisiveness doesn’t mean you aren’t open to learning but that you have a clear vision and can translate it into bottom-line decisions. Strong decision making that aligns with your organization’s values and the needs of your team brings great results. Appreciate hard work. Don’t be one of these leaders who doesn’t respect effort or who thinks hard work is just the minimum that people should do. Express appreciation for effort and hard work and do it often, because those who feel recognized and valued will continue to work harder than those who don’t. Appreciation builds confidence and engagement. Lead by example. People look up to leaders. They are constantly watching you and seeking your guidance, support and coaching, so it’s imperative that you set a good example, Whatever expectations you have of others, set the example yourself. Act in the ways you want others to emulate. Lead from within: There are many ways to manage a team, but to lead a team takes range of specific skills that are practiced and repeated daily. The post This is the Best Way to Manage Your Team appeared first on Lolly Daskal. We’re all ridiculously busy these days. Nearly every leader I talk to feels overloaded and overwhelmed. As crazy as it may seem to add something else to your to-do list, there’s no better time to invest some energy in thinking about how you work and finding ways to be more productive and effective, because the payoff will start immediately. The difference between being busy and being productive. A lot of people think they’re the same. But busy-ness is easy to fall into and productivity is hard work that requires clarity, focus and strategic thinking as part of a larger plan. The difference between something that’s important and something that’s urgent. Lots of things seem important in the moment, but in reality they’re urgent—which lends them an air of false importance. It was President Dwight D. Eisenhower—a master of time management—who pointed out that the most urgent decisions are rarely the most important ones. When you’re stressing over an issue or engaged in making long-term strategic plans, keep this distinction in mind. The difference between procrastination and focus. Procrastination is easy, while true motivation requires focus, hard work, and following through. As much as possible, avoid setting down something unfinished to work on something new. The difference between working hard and working smart. Hard work involves both physical and mental effort, while smart work is all mental and logical. Working hard keeps you on the path toward meeting a goal, but working smart usually knows some good shortcuts. The difference between a bad and good habit. The first step in truly understanding this distinction is to identify your habit loops. Then you’re ready to evaluate them and, where you need to, make a change. Old habits, as they say, die hard. They may have already reprogrammed your brain. But you can create new habits to replace the old ones that keep you from being effective or productive. The difference between when to say yes and when to say no. Knowing when and how to say no frees you to say yes only to proposals that meet your personal criteria and projects you’re genuinely excited about. The more you say no, the better you’ll be able to focus on your most important work. The difference between overwhelming and manageable projects. It’s as simple as breaking things down into smaller tasks. When you do, you’re forced to think through each step up front. Remember, small things done consistently create major impact. Once you really understand and absorb these principles, you’ll be prepared to handle any situation. And, as if that weren’t enough, you’ll be more relaxed and confident. You’ll get more done with less effort, more effectiveness and no down side. Lead from within: Productivity doesn’t happen on its own, it’s a task you must do every day to get the right work done effectively. The post How to Effectively Get the Right Work Done appeared first on Lolly Daskal. For anyone who works within an organization, meetings are a fact of life. And there are few things in corporate life worse than badly run meetings—the ones that don’t start on time and don’t stay on track but circle around and around in endless discussion with no direction, leaving everyone to wonder who’s in charge. It doesn’t have to be that way. A meeting that’s structured and run well can be an effective and even productive use of everyone’s time. As a leadership and executive coach, I’ve helped hundreds of chief executives learn how to run effective meetings. Provide an agenda in advance. An effective meeting needs prep work, and that means putting together an agenda. An agenda is a great tool for making sure your meetings stay on track and on time. It can help you set expectations up front, organize the subjects you want to cover into a workable structure, and avoid wasted time. Send the agenda and any important background material 24 hours in advance. Once you’ve prepared your agenda, send it to participants for input. There may be something important that another participant wants to talk about, or something you’ve forgotten to add—or there may be some points you’ve listed that are already resolved. By sending the agenda and other meeting materials in advance, you give people a chance to prepare and make the most of their time. Highlight important agenda items. Make a list of the highest-priority items, the ones that are the most important or urgent. Get through those before you tackle the lower-priority items so if something takes longer than planned you don’t have to let the meeting run late. Determine whether each agenda item requires a decision or is open only for discussion. Then include both lists as part of the agenda. If possible, assign and enforce time limits for all speakers on each agenda item. Prepare yourself. For every meeting on your calendar, schedule a 15-minute block of prep time. Use that time to think of ways you can add value to the meeting. Good preparation will allow you to lend your expertise to the meeting. Start on time. If you don’t start your meetings on time, chances are you won’t end on time. Then the next meeting starts late. Before you know it, the entire day is off schedule. This strict time rule needs to happen at every level of the organization, starting from the very top. Gather the right people. Give some thought to the list of people who should be there because of their expertise, their great ideas, or their need to know. At the same time, don’t waste the time of people who don’t have a reason to be there. Stay away from rabbit holes. Every meeting has a tendency to stray off topic. If the subject begins to wander, quickly move back to the agenda. Don’t be afraid to intervene and bring the conversation back to the topic. Have a parking lot. When a meeting goes off topic but the discussion is a good one to talk about, park the idea with a commitment to revisit it at a later meeting. Then make sure you really do revisit it. End on time. If you’re good about setting an agenda with clear outcomes, you will know when a meeting needs to end. People have short attention spans. By keeping meetings short and timely, you have a better chance of holding their attention. Time is a precious resource, and no one wants their time wasted. Streamline meetings as much as possible. Summarize each agenda item when you’ve finished discussing it. At the close of the meeting, summarize the next steps that the group has decided to take. This will ensure that everyone is clear on the tasks that have been assigned to them and the actions they need to take next. Capture decisions and discuss next steps. You may have had a wildly productive meeting, but if the decisions weren’t captured, it could be as if it never happened. End every meeting with clear agreements and make notes on final decisions. Make sure you capture any immediate actions and assign them to the appropriate people. Send out your meeting notes promptly to everyone who attended to provide people with something to refer back to. When you know how to lead great meetings, your team will have less wasted time, less frustration, and more time and energy for everyone to do the work that matters most. Lead From Within: Meetings are good if they are productive, if they waste your time, get rid of them, because actions speak louder than words. The post How to Make Your Management Meetings More Productive appeared first on Lolly Daskal. Many of the leaders I work with are anxious to hear tips on time management. But after working with business leaders and executives for over three decades, I’ve come to realize that the most effective and successful leaders treat time management as a secondary concern. For them, it’s energy management that produces real results. Most of my clients—and most leaders in general—have a lot to accomplish. When it feels like there aren’t enough hours in the day to do what you need to do, it’s all too easy to push yourself beyond your limits. As a result, you can become burned out long before you accomplish your goals. It’s about getting the rest you need. People try to get everything done in an all-nighter, but in fact the longer you stay up the less productive you become. It’s best to get a good night’s sleep and start fresh. It’s about quality, not quantity. I don’t know any business leaders who don’t have too much to do. It’s not about how much you can get done but how you get it done. Quality always wins out over quantity. It may even give you the zest to do more—it is a powerful feeling when you get things done with excellence. It’s about being present without being distracted. The best way to manage your energy and time is to be fully present with whatever, or whoever, needs your attention. When you have true focus, you can accomplish tasks twice as fast with more energy left over. It’s about taking small breaks. Multiple studies have found that you have more energy for the day’s tasks, especially work-related tasks, if you take short breaks throughout the day. Those can be as simple as five to 10 minutes of stepping away from your work space and getting into a different mental zone — for instance, taking a short walk, completing an unrelated task, listening to a favorite song or reading something else. Research suggests that distracting yourself briefly once an hour gives you more energy to work during the day productively. It’s about working out. You’ve likely heard it a thousand times already: exercise gives you endorphins, endorphins make you happy and being happy gives you energy. When you feel like you don’t have the energy to exercise and you drag yourself to the gym, you’ll leave feeling more energized. Numerous studies point to regular exercise as having a significant role in increasing energy levels and reducing fatigue. Lead from within: If you are truly mindful of your energy and you manage it well, you’re likely to become far more productive—and, as a result, a more effective leader. The post How Successful Leader Manage Their Energy Not Their Time appeared first on Lolly Daskal.